Lunar exploration project Pioneer, America's bid in the early space competition, was approved in March 1958 under the initial direction of the Advanced Research Projects Agency, which assigned hardware development to both the Air Force and the Army. But the two services each had a distinct approach to Pioneer, and the differences plagued the project from the start. On their first try, the Air Force team produced an unplanned pyrotechnic display when a Thor-Able launch vehicle exploded 77 seconds after liftoff from Cape Canaveral on 17 August 1958. Pioneer 1, launched on 11 October that year, was another disappointment; an early shutdown of the second stage prevented its attaining a velocity sufficient to escape Earth's gravity. After a 115 000-kilometer trip toward the moon and 43 hours in space, the probe burned up when it reentered Earth's atmosphere. The next month, Pioneer 2 's third stage failed to ignite; this spacecraft was also incinerated as it fell back to Earth. Meanwhile, the Army Ballistic Missile Agency and the Jet Propulsion Laboratory were working on a Pioneer lunar probe to be launched by a combination vehicle called Juno II, a Jupiter intermediate range ballistic missile with upper stages developed by JPL. A 6 December 1958 attempt to launch this four-stage rocket to the moon failed when the Jupiter first stage cut off prematurely. Pioneer 3 reentered after a 38-hour flight. Pioneer 4, the last of the series initiated by the Advanced Research Projects Agency, rose on its Juno II launch vehicle on 3 March 1959 and traveled without incident to the moon and beyond into an orbit around the sun, but without passing close enough to the moon for the lunar-scanning instruments to function. The U.S. attempt to beat the Soviet Union to the moon had already failed: Luna 1, launched 2 January, had flown by its target on 4 January. Luna 2 next became the first spacecraft to land on another body in the solar system, crashing into the moon on 13 September 1959. Luna 3, launched 4 October, returned the first photographs of the moon's far side. The Ranger spacecraft-designed to strike the moon's surface after transmitting television pictures and gamma ray spectrometry data during descent-was one of the payloads planned for the Atlas-Vega launch vehicle. Atlas, an Air Force intercontinental ballistic missile developed by General Dynamics-Astronautics, had been selected by Abe Silverstein's Office of Space Flight Development for early manned orbital missions and deep space probes, and the decision had been based on several sound premises. If Atlas could be so adapted and if Thor and other intermediate  range ballistic missiles could be used for lightweight Earth satellites, then most of the funds NASA had earmarked for launch-vehicle development could be used for the development of a family of much larger liquid-propellant rockets for manned lunar missions. The space agency could purchase Atlas missiles from the Air Force and provide upper stages tailor- made for any particular mission, whether science in deep space or manned Mercury missions near Earth. As defined in December 1958, three basic elements composed Atlas-Vega: (1) the Atlas missile, with its so-called stage and a half; (2) a modified Vanguard engine for the second stage; and (3) Vega, a new third stage under development at JPL. Vanguard was produced by General Electric. JPL's Vega would provide the extra thrust to reach the velocities necessary for planetary flights. According to the estimates, the combination would be able to place 2250 kilograms in a 480-kilometer Earth orbit or send approximately 360 kilograms to the moon. The first Atlas-Vega flight was optimistically scheduled for the fall of 1960. On 17 December 1958 in Washington, representatives from NASA, the Advanced Research Projects Agency, the Army, and the Air Force considered launch vehicle development and agreed that a series of versatile, increasingly powerful launchers was a desirable goal. However, NASA wanted its first new launch vehicle to be Atlas-Vega, while the Air Force favored the smaller Atlas-Agena. Since neither vehicle could meet the requirements of both organizations, NASA and the Air Force agreed to pursue their separate courses. Both approved Atlas-Centaur, a higher-energy rocket under development for future use, but only the space agency projected a need for the much larger Saturn. Atlas-Vega, however, was not destined to fly to either the moon or the planets; a competitor blocked the way. The Air Force had been concealing a significant fact-Lockheed Missiles & Space Company had been developing a much more powerful version of Agena, the B model. 5 The uprated Atlas-Agena B was unveiled in May 1959, almost instantly killing Atlas-Vega. An artist's concept of the Vega Mars probe as seen from the Martian moon Deimos was presented to the Senate Aeronautical and Space Science Committee on 7 April 1959. In December, going one step further in asserting headquarters' leadership, Silverstein outlined for JPL the space agency's plans for lunar and planetary missions for the next three years. Earlier that month the NASA Lunar Science Group, chaired by Robert Jastrow, had met to discuss proposals for lunar exploration. Harold Urey, Thomas Gold, Harrison Brown, and other scientists had agreed that a hard lunar landing, which by its crashing impact could help determine the nature of the moon's surface structure, would be an important first step. High-resolution pictures of the moon before impact would also be most important. Basing plans on the advice of the lunar group and the change in launch vehicles, Silverstein  advised Pickering that seven flights were planned through 1962. The first five would be launched by Atlas-Agena B for "lunar reconnaissance" in 1961-1962; two other spacecraft would be sent by Atlas-Centaur to Mars and Venue in 1962. 11 As part of an integrated lunar exploration program, the lunar spacecraft, Ranger, should also be capable of depositing an instrument package on the moon. d. a spacecraft for use with the Saturn for unmanned circumlunar missions and return leading to perhaps some modifications for manned circumlunar missions and return. As headquarters directed, JPL personnel set about defining a lunar impact mission, but Atlas-Centaur-boosted spacecraft of the future were also an active concern. NASA hoped Surveyor, the first of these advanced craft, would allow a "tremendous stride forward in lunar exploration," since it would land softly on the moon, carrying a number of experiments,***  including a surface sampler and an atmosphere analyzer. These instruments would provide scientists and designers information they needed to plan more sophisticated unmanned and manned landing missions. Mariner, the second spacecraft family to be powered by Atlas-Centaur, would be directed toward Venus and Mars. Two kinds of Mariner spacecraft were planned: an A model that would simply fly by those planets and a B model that could release a landing capsule toward Mars or Venus as the main bus flew by. A 1962 Mariner was expected to be launched toward Venus to measure the planet's surface temperature distribution, examine the atmosphere, and determine the extent of the magnetic field as it flew by. Still later in the 1960s, two multipurpose spacecraft, Prospector and Voyager, atop mighty Saturn launch vehicles were to extend the scope of unmanned lunar and planetary exploration even further. 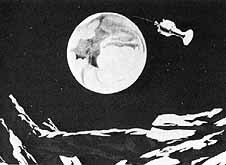 Prospector was being designed to roam about the lunar surface as directed from Earth and examine the moon with a sophisticated array of instruments. Subsequent lunar rovers were to be used as logistic vehicles to marshal supplies for manned missions to the moon, or possibly as an early means of returning experiment samples. Voyager, too, was being designed with growth in mind. From the first missions in 1964 to either Venus or Mars with slightly larger landed payloads than the Mariner B capsule, Voyager was to grow larger and larger until a mechanized rover was sent to Mars or Venus. Prospector and Voyager represented the very distant future, but by the summer of 1960 JPL and NASA Headquarters were beginning to give serious attention to Surveyor and Mariner. 14 Both of these craft were scheduled for launch by Atlas-Centaur-the number two vehicle in NASA's plans-but development problems with the Centaur stage would seriously affect the timetable. * In 1965, NASA revived Project Pioneer with a new objective: to complement interplanetary data acquired by Mariner probes. ** The distinction between programs and projects was first made clear by G. F. Schilling, Office of Space Science, late in 1959. Programs signified a related and continued series of undertaking greared toward understanding a broad scientific or technical topic; programs (e.g., examining the solar system) did not necessarily have foreseeable ends. Projects were the building blocks for programs and as such had limited objectives, limited duration (e.g., Project Mariner, Project Viking). While the space science personnel at NASA tended to maintain this distinction over the years, the concept was not as clearly observed in manned spaceflight, where the Apollo project grew so large it became a program. *** The term experiment, as NASA uses it, refers to any exercise whose purpose is to gather scientific or engineering data (and also to the equipment used to perform an experiment). Few scientists would apply the term to some NASA experiments, e.g., photography of Earth from orbit.